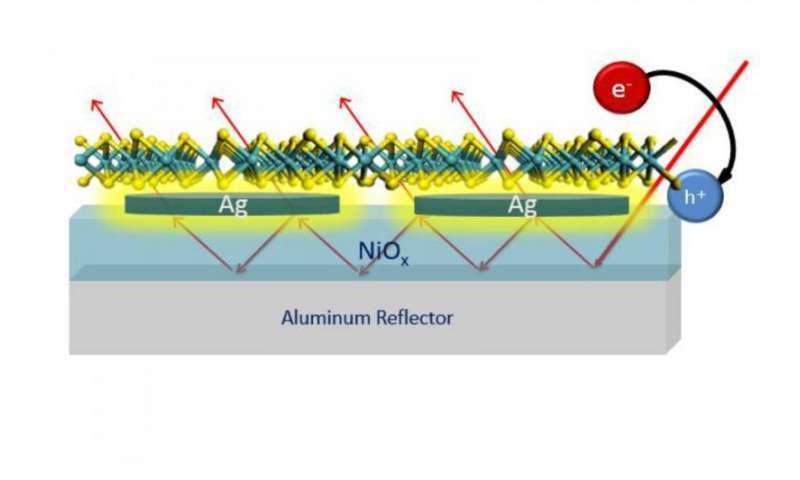 "Basically, we want to understand how much light can be confined in an atomically thin semiconductor monolayer of MoS2," said Thomann, assistant professor of electrical and computer engineering and of materials science and nanoengineering and of chemistry. "By using simple strategies, we were able to absorb 35 to 37 percent of the incident light in the 400- to 700-nanometer wavelength range, in a layer that is only 0.7 nanometers thick." Thomann and Rice graduate students Shah Mohammad Bahauddin and Hossein Robatjazi have recounted their findings in a paper titled "Broadband Absorption Engineering To Enhance Light Absorption in Monolayer MoS2," which was recently published in the American Chemical Society journal ACS Photonics. The research has many applications, including development of efficient and inexpensive photovoltaic solar panels. "Squeezing light into these extremely thin layers and extracting the generated charge carriers is an important problem in the field of two-dimensional materials," she said. "That's because monolayers of 2-D materials have different electronic and catalytic properties from their bulk or multilayer counterparts." "If light absorption in these materials was perfect, we'd be able to create all sorts of energy-efficient optoelectronic and photocatalytic devices. That's the problem we're trying to solve," Thomann said. She is pleased with her lab's progress but concedes that much work remains to be done. "The goal, of course, is 100 percent absorption, and we're not there yet."